Building on the successful Lower Colorado Regional Office Building and the 2011 campus master plan, TSK completed the rehabilitation and reconstruction of two historically significant buildings on the Bureau of Reclamation Date Street Campus. Built in 1941, the Electrolytic Manganese Pilot Plant (Building 500) and Ore Dressing Pilot Plant (Building 600) anchored the center of the Bureau of Mines site where Building 1400 was constructed. 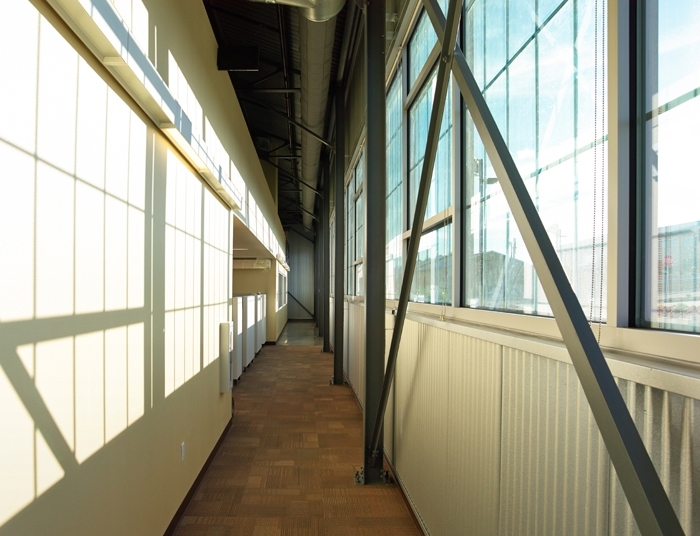 Both buildings were multi-story industrial buildings clad with corrugated metal. To the south and east of these buildings are Buildings 100 and 200. Both of these buildings fall within the boundaries of Boulder City’s Historic District and therefore mandated to reflect the character of its original design. Like Buildings 500 and 600, Building 100 was built in 1941 as part of the Electrolytic Manganese Pilot Plant, but architecturally reflects the residential masonry and clay tile roof construction from Boulder City’s worker homes surrounding the campus. Building 200 was originally built in 1931 for Six Companies, Inc., and served as the vehicle repair garage during the construction of the Hoover Dam. The building was clad with corrugated metal and ribbon windows. It also featured large overhead roll-up doors for the repair bays. These buildings serve as the historic precedents and foreground for the revitalized campus. The entire campus is a former brownfield site operated by the Bureau of Mines from 1941 to 1983. In 1985, the Bureau of Reclamation took title to the property and began remediation efforts to address cleanup requirements from the ore refining process research activities.